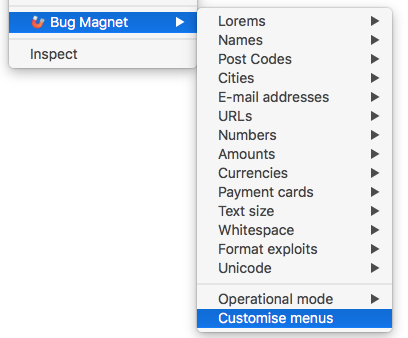 The easiest way to customise BugMagnet is to add your own config files to it. Just click on the Customise Menus option in the context menu, then select additional files to load. You can load local files, load a configuration published on a web URL, or paste the configuration directly from the clipboard. a String property is a menu item. The property name is used as a menu item label and the value is inserted into the text field on click. an Array property is a sub-menu, allowing you to quickly add a list of Strings without a special label (the element values are used both as menu labels and as text to insert). For some more example files, check out the extras folder. Alternatively, if you’d like to distribute a different configuration to a larger group without people individually having to load items, add your own values to the main config file (template/common/config.json) and rebuild the extension. See the Developer Guide for more information on how to create a local build.